I picked up this bottle from Waitrose, in a bit of a mixed bag of whatever took my fancy as I strolled around the aisles. When I got home I found alongside the mushrooms, squash, sweet potatoes and pomegranates there were plenty of plummy, blackberry flavoured wines in a decidedly autumnal selection of food and drink. It’s surprising what a foggy morning will do for you. 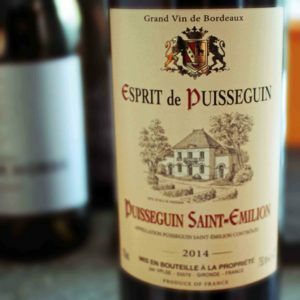 This Esprit de Puisseguin St Emilion ’14 is an attractive colour, almost paint chip perfect claret. It smells fruity, and whilst my autumnal obsession may be sneaking from my brain and into my nose, it did smell of spiced baked plums. It’s dry with a medium soft acidity. The tannins are soft and smooth, giving the wine a velvety feel. It’s medium bodied and the alcohol level is also medium. It tastes plummy and fresh. It’s almost like it’s a wine designed to be middle of the road. Not that I object to middle of the road, I’m a fan of smooth jazz. Perhaps a kinder description would be a “Goldilocks wine”, it’s not too dry, not too sharp, not too tannin-y, not too oaky, not too boozy – whilst not being insipid or flavourless, just really balanced. This wine is unlikely to anyone’s favourite, nor is anyone going to hate it. It’s the exact opposite of Marmite. It would make a great choice for a party where you have different people to keep happy, or as a gift when you don’t know the recipient’s tastes very well. At £12 it’s a reasonably priced, good, safe choice.